A dead NASA satellite will plummet to Earth on Friday (Sept. 23), and while the U.S. space agency doesn't know exactly where pieces of the massive spacecraft will hit, one thing is certain: North America is in the clear. NASA's Upper Atmosphere Research Satellite, or UARS, is set to make an uncontrolled re-entry into Earth's atmosphere on Friday. However, it is still too early to tell exactly where the 6.5-ton spacecraft will fall. Scientists will likely have a much better idea of where the debris will land about two hours before the impact, NASA officials said. But, NASA was able to rule out North America as being in the potential debris drop zone. "Re-entry is expected sometime during the afternoon of Sept. 23, Eastern Daylight Time," agency officials said in a statement. "The satellite will not be passing over North America during that time period. It is still too early to predict the time and location of re-entry with any more certainty, but predictions will become more refined in the next 24 to 48 hours." In the meantime, NASA and the U.S. Air Force will be closely monitoring the satellite and its decaying orbit. Current predictions of the potential impact zone cover a giant swath of the planet — anywhere between the latitudes of northern Canada and southern South America. Scientists will be able to refine these projections as the spacecraft makes its fiery journey through the atmosphere. "It's partly a matter of not knowing enough," said Ray Williamson, executive director of the Secure World Foundation, an organization dedicated to the peaceful use of outer space. "The shape of the structure is not perfectly spherical, so when it heats up and starts to break up, it will break into odd pieces. Once it begins to break up, then they can get a better sense of where this is roughly going to hit." Scientists at NASA's Orbital Debris Program Office estimate that at least 26 large pieces of the bus-size satellite will endure the scorching heat of re-entry. Approximately 1,170 pounds (532 kilograms) of material are expected to reach the ground, NASA officials said. Instead, it's much more likely that the debris will fall over water or remote, uninhabited areas, NASA officials said. "There's always a concern," Matney said. "But, populated areas are a small fraction of the Earth's surface. Much of the Earth's surface has either no people or very few people. We believe that the risk is very modest." For comparison, when NASA's space shuttle Columbia tragically broke apart during re-entry in 2003, debris from the 100-ton spacecraft was scattered across Texas, but did not damage any structures or injure any people. "When [Columbia] came back, as the shuttle heated up, it broke into pieces — some of them very large, and some very small," Williamson said. "Even then, there was difficulty in trying to find the pieces that were spread over such a large area. It was such an unpopulated area that it was very difficult to locate all the pieces, even though they knew from videos pretty much precisely the track that it followed across the atmosphere." 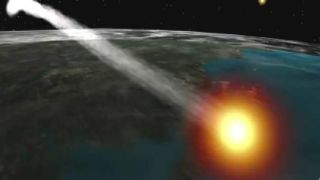 NASA has calculated the odds of anyone anywhere in the world being hit by a piece of the UARS satellite at 1in3,200. But, the chance that you personally will get hit is much more remote, on the order of 1inseveral trillion, Williamson said. Still, if anyone happens to stumble upon a piece of the defunct satellite on the ground, agency officials stress that for safety and legal reasons, it is best to leave the material where it is, and alert the authorities. "If you find something you think may be a piece of UARS, do not touch it," NASA officials said. "Contact a local law enforcement official for assistance."